‘Facing the sun’—Winter solstice alignments [CLICK THE LINK TO READ THE ARTICLE] Frank Prendergast, Muiris O’Sullivan, Ken Williams and Gabriel Cooney discuss an extraordinary seasonal phenomenon. A stone shrine for a relic of St Thomas Becket in Dublin? —Paul Duffy and Tadhg O’Keeffe explore an interesting possibility. 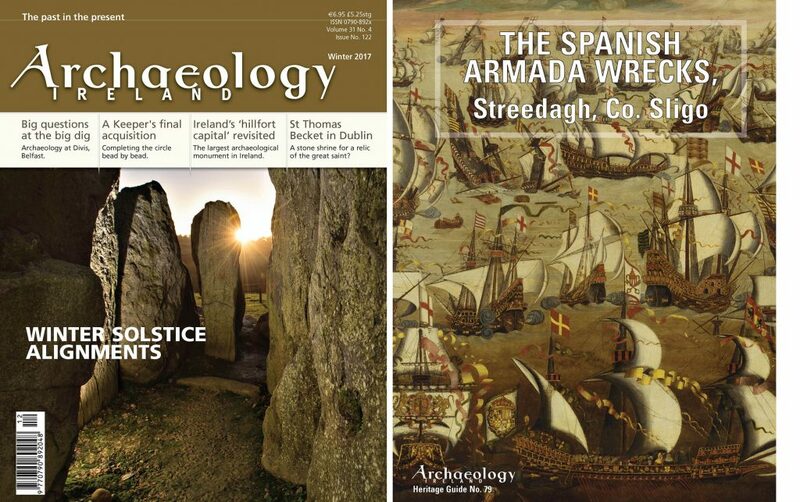 Ireland’s ‘hillfort capital’ revisited—James O’Driscoll describes an impressive palimpsest of prehistoric monuments in County Wicklow. New insights into the church known as St Crispin’s Cell and the site of Rathdown Castle, Co. Wicklow—Marie Burbridge, Frank Coyne, John Harrington, Colin Love, Ejvind Mogensen and Paul Duffy detail the archaeology of the area and outline the results to date of an ongoing archaeological project. The last acquisition—completing the circle bead by bead—Mary Cahill describes an interesting curatorial dilemma. Big questions at the big dig—Harry Welsh, Ruairí Ó Baoill, Ruth Logue, Malachy Conway and Lizzy Pinkerton report on an interesting project at Divis, Belfast. Know your monuments: Sugar-refining—In this contribution to the Know Your Monuments series, Muiris O’Sullivan and Liam Downey outline the historical refining of sugar in Ireland and highlight the remarkable success of the Irish Sugar Company.